Danna and the Buffalo Girls are at it again. That’s right the second annual Flea Market and Swap will be held October 11th, 12th and 13th on Texas State Hwy 11 just 2 miles west of Hwy 37 in Winnsboro and will be open that Thursday from 12 noon to 6pm Friday and Saturday 9am to 6pm. Danna is encouraging shoppers and venders to come join us for an outstanding TRADIN weekend. Danna is no rookie to the flea market scene with nearly 30 years under her belt as a Canton First Monday staple, so look forward to another great show that is sure to be a Picker’s Paradise and a Shoppers’s Dream. 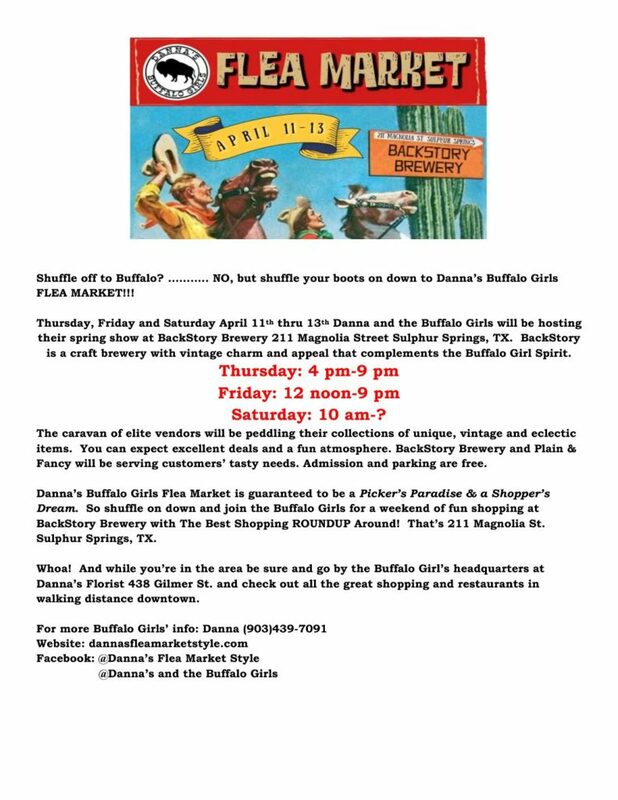 Remember, Danna’s Flea Market and Swap will be held annually in Winnsboro, TX on the second weekend of October and Danna’s Flea Market and Swap will be held twice annually in Sulphur Springs, TX on the second weekend of April and the second weekend of November. The next show in Sulphur Springs is scheduled for November 8th, 9th, & 10th (hours to be announced) at the Hopkins County Reginal Civic Center on Texas State Hwy 11 (Houston Street). Okay, so we did a thing…..